I HIGHLY RECOMMEND the Consumer Price Index Inflation Calculator offered online by the U.S. Department of Labor’s Bureau of Labor Statistics. This gizmo clarifies a multitude of issues. Among them in Part 1 are current prices of gasoline versus the old day’s and the cost of new cars. Tomorrow, we’ll examine my not buying a Bugatti Type 57 in 1967, and also U.S. Secretary of the Treasury Steven Mnuchin’s noodling the idea of inflation-indexed taxes on capital gains. The Consumer Price Index, or CPI, is based on costs of goods and services ranging from housing to transportation to recreation to apparel. From time to time, these are given new weightings based on consumer behavior. The calculations are carried out to three decimal places. 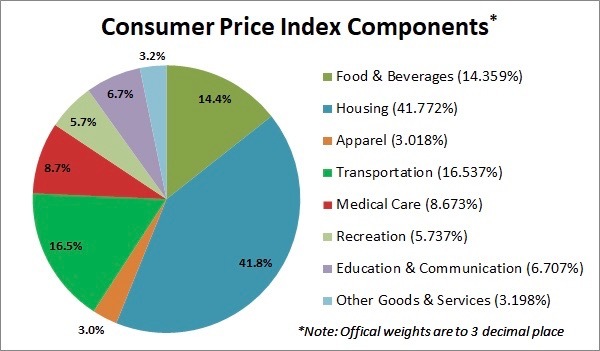 Consumer Price Index Components. Image from the U.S. Bureau of Labor Statistics, its most recent reweighting, December 2017. The online CPI Inflation Calculator examines changes in these CPI data over time. Its data base extends from the latest month back to January 1913, the first year of CPI data collection. Use of the CPI Inflation Calculator is as simple as can be, and can work either forward or backward in time. Enter the dollar value and two dates, and the CPI Inflation Calculator does the work. The Consumer Price Index Calculator is online at data.bis.gov. By the way, for dates before the 1913, there’s another online calculator based on U.S. BLS statistics at in2013dollars.com, with index tracking from 1635. For instance, according to the website, one dollar’s value back in 1663 (in English guineas or Spanish doubloons?) is worth $56.00 today. That 30¢ Gasoline? A few of us may recall paying 30¢/gal. for gasoline in 1958. How outrageous is today’s national average of $2.87? Or California’s $3.62? 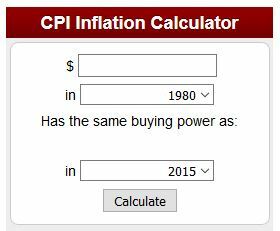 The CPI Inflation Calculator tells us: That 30¢ is worth $2.64 today. Yep, today’s actual prices are higher, but our gasolines, especially California’s and others’ Phase 3 Reformulated blend, are cleaner, lead-free, post-OPEC, and more complex to produce than 1958’s counterparts. Why Are Today’s Cars So Expensive? According to “Trending, Automotivewise,” here at SimanaitisSays, the average transactional price for a new 2017 car was $35,126. I remember when a new car cost only…. Pick a year, any year. 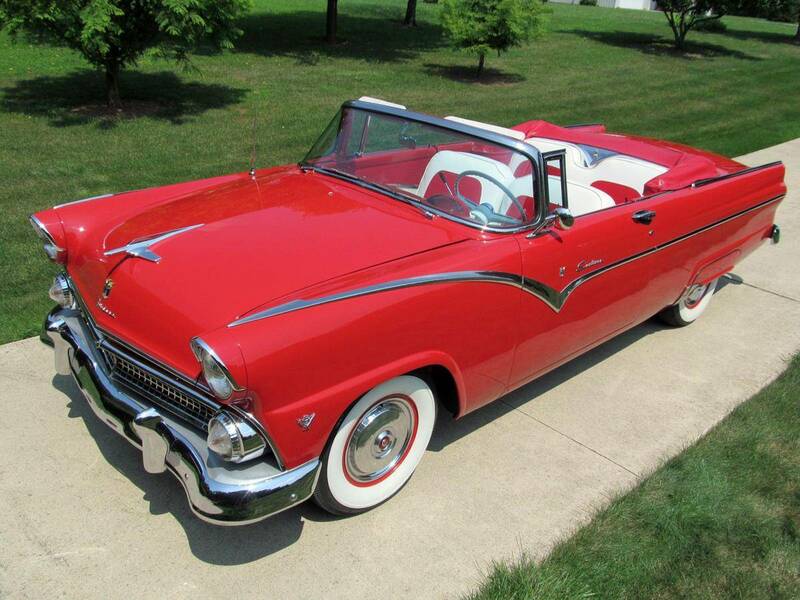 I’ll pick 1955 when my dad bought our family’s bright red new Ford Fairlane Sunliner convertible for $2324. The CPI Inflation Calculator equates this dollar value with $21,933.42 today. 1955 Ford Fairlane Sunliner. 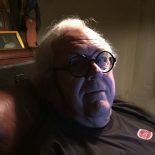 Image from lookatthecar.org. It was, however, “only” a Ford. Had dad lusted for a Caddy convertible, it would have cost him $4448 back in 1955, equivalent to $41,979.29 today. What’s more, only the fancy cars then had a/c, am/fm radio, electric windows, etc. And even they had none of today’s environmental or safety requirements. For instance, Ford’s padded dash and other Lifeguard safety features didn’t show up until 1956; they were generally panned at the time. This entry was posted on August 2, 2018 by simanaitissays in And Furthermore... and tagged 1955 Ford Fairlane Sunliner convertible, BLS CPI Inflation Calculator, Bureau of Labor Statistics Consumer Price Index Inflation Calculator, gasoline prices 30 cents 1958 $2.64 today $3.62 California, new car prices versus those in 1955, pie chart of Consumer Price Index categories.